The social function of the Internet has changed dramatically in recent years. What was, until recently, a supplement to other channels of information and communication has become increasingly a basic requirement of social and economic inclusion. Educational systems, employers, and government agencies at all levels have shifted services online—and are pushing rapidly to do more. Price remains only one factor shaping the fragile equilibrium of home broadband adoption, and library and community organizations fill the gap by providing critical training and support services while under severe economic pressures. 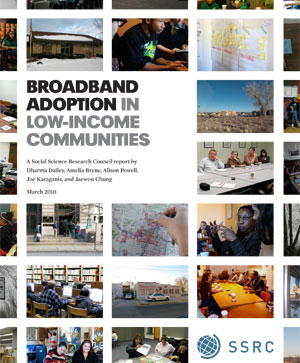 Commissioned by the Federal Communications Commission (FCC) to analyze the factors shaping low rates of adoption of home broadband services in low-income and other marginalized communities, this SSRC study is one of the only large-scale qualitative investigations of barriers to adoption in the US and complements FCC survey research on adoption designed to inform the 2010 National Broadband Plan. The study draws on some 170 interviews of non-adopters, community access providers, and other intermediaries conducted across the US in late 2009 and early 2010 and identifies a range of factors that make broadband services hard to acquire and even harder to maintain in such communities. Dharma Dailey, Amelia Bryne, Alison Powell, Joe Karaganis and Jaewon Chung, Broadband Adoption in Low-Income Communities (Social Science Research Council, 2010).